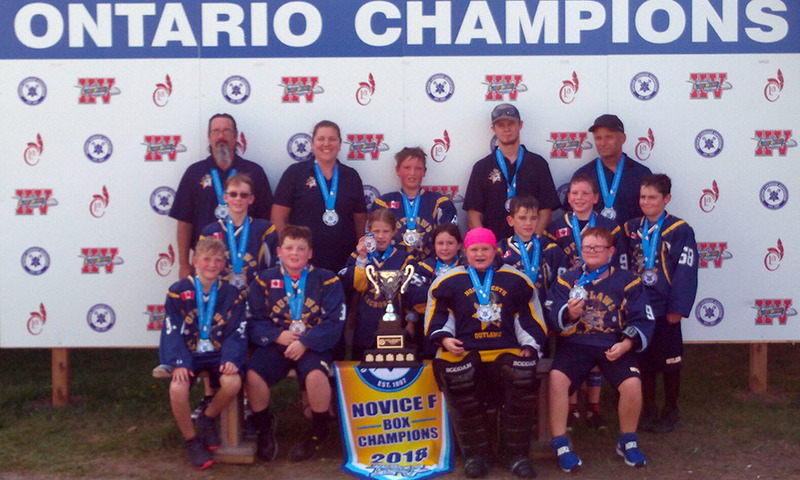 The North Perth Outlaws Novice Lacrosse team recently attended the Ontario Lacrosse Festival in Whitby to compete for the Ontario Lacrosse Association’s Novice “F” Provincial Championship. The festival is the largest youth lacrosse festival in North America with approximately 500 teams and almost 10,000 players participating in various age groups and divisions during the 10-day event. The Outlaws Novice team, which features several local players, was riding high after just completing Zone 8 playoffs, where they went undefeated in round-robin play. They narrowly lost the Zone 8 “E” championship by a score of 4-3 against the Centre Wellington Mohawks. After the Bantam Outlaws claimed the “E” Provincial Championship the previous weekend, day one of novice provincials saw the North Perth team win its first two round-robin games. They repeated on day two with two more wins, cruising into the gold medal game on Sunday against the Cambridge Chiefs. The Outlaws were extremely confident, but the Chiefs weren’t intimidated as they jumped out to a 4-1 lead after one period of play. The teams traded goals early in the second period, but the determined Outlaws were able to add two more to narrow the lead to 5-4 going into the third period. North Perth scored again to tie things up in the third, but neither team could cement a victory in regulation, forcing a 10-minute overtime period with the game tied 5-5. The momentum continued to swing in the favour of the Outlaws, as they outscored Cambridge 4-1 in overtime to complete the dramatic come-from-behind victory 9-6 to claim the gold medal. The team members showed significant improvement over the course of the season and were rewarded for all their hard work.